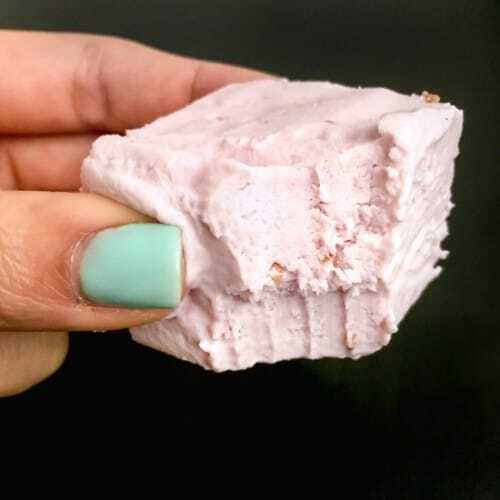 This Healthy Raspberry Coconut Fudge is naturally sweet, incredibly rich, smooth and uber coconutty, you’d never know it’s refined sugar free, low carb, high protein, and gluten free too. Raspberries are great on top of cheesecakes and ice cream, baked into cakes, crostatas, tarts and pies, added to smoothies, yogurt and oatmeal… but most of all, they’re great on their own. Personally, I like to mix raspberries into stuff. They’re great with dark chocolate (or any chocolate), but I like ’em best with coconut. ^^ Stirring in the luscious melted coconut butter. Of course! Not only are raspberries sweet and delicious, they’re packed with antioxidants, fiber, vitamins, and minerals. Since they’re already sweet on their own, there’s no need to add excess sugar and calories to recipes that use them. Raspberries truly make dessert (and life) better! 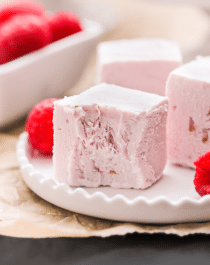 This Healthy Raspberry Coconut Fudge is naturally sweet, incredibly rich, smooth and uber coconutty, you'd never know it's refined sugar free, low carb, high protein, and gluten free too. Rinse the raspberries, then toss them onto a paper towel to get rid of any excess water. In a blender or food processor (I used my Vitamix), add the raspberries, yogurt, cottage cheese, vanilla paste, and Truvia. Blend until completely smooth. While blending, add in the coconut flour (or coconut flour and psyllium husk powder). Mixture should be very thick, like frosting. Scoop the mixture into the prepared brownie pan and spread it out. Cover with plastic wrap and freeze overnight, or until solid (the coconut flour + psyllium option can be refrigerated overnight). Bring the pan out of the freezer for ~30 minutes to thaw (or fridge). Transfer the fudge out of the pan using the parchment paper overhang, then slice into 36 cubes. Serve immediately or cover and freeze to store (refrigerate the coconut flour + psyllium option). **OR ¼ cup Coconut Flour + 1 tbs Psyllium Husk Powder. 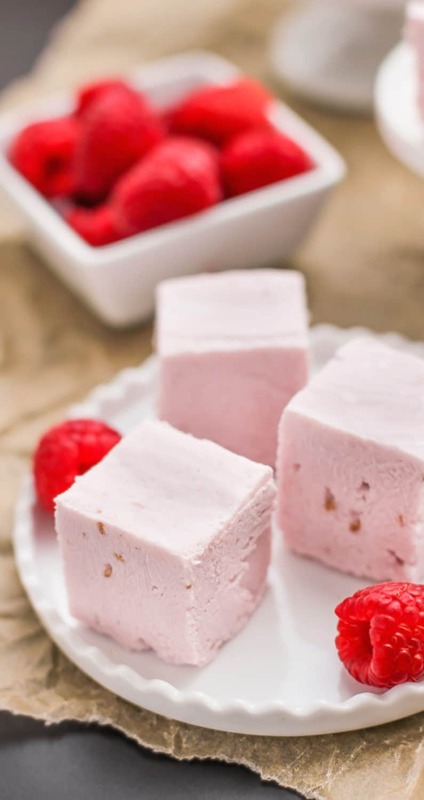 I can eat this Raspberry Coconut Fudge alllll day long. This looks really good. I’m going to try to make these for my kids. Love the website. I made these this morning, they are in the freezer now. I sampled the batter as I was making it, it’s pretty yummy. Can’t wait to sample the finished product. This blog is AWESOME and clever! Where do you come up with these genius recipes?? I love all the ingredients you’re using and they look absolutely delicious, perfect for summer! Is coconut butter the same as coconut oil that is congealed? Do you have a dairy free alternative? Could I do it with coconut milk yogurt? Mmmmmm. 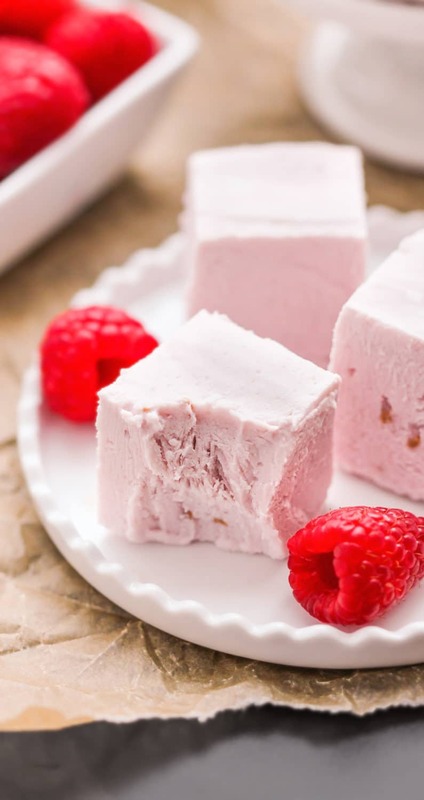 I’ve been wanting to make this recipe or quite a while and when you came out with the cake batter fudge I decided it was finally time to go get the raspberries. I let it freeze overnight and just finished cutting and eating it. I made 16 bars and ate three of them in like 10 min. they are so good! Now onto the extensive subs. I made, I used a 32 oz tub of vanilla greek yogurt and totally skipped the cottage cheese ( I love yogurt and don’t normally have cottage cheese unless its for one of your recipes ). I used two and a half teaspoons plus a splash of vanilla extract. Skipped the truvia and used 3 tbs honey. And finally didn’t realize there was a difference between coconut oil and butter until reading these comments so I used half a cup melted coconut oil instead of a full cup coconut butter. When I transferred the mixture to the bowl and started whisking in coconut flour I continuously dipped my finger in and licked it while I whisked. I really don’t know how any of it made it to the freezer, I must have ate a fourth of it just mixing. After I added the coconut oil I had my mom taste it. I love coconut and raspberries but she isn’t a coconut fan but loves raspberries even more then me. She said the coconut was too overpowering I thought it was fine but I added a splash of vanilla extract ( I am really numb to extracts ) and thirty drops of stevia extract and that did the trick for her. It tastes delicious, sosososososoooooo good, maybe its because of all the subs I made but I wouldn’t really say it has a fudge texture, more like a frozen yogurt bar. But who cares about texture when this little bar can taste so good? Coconut butter firms up a little better than coconut oil, but I’m glad it ended up firming up later. Thanks so much for taking the time to make the recipe V! This was not good. 🙁 Expensive ingredients, too! Salty and gritty. Did you make any ingredient substitutions? Because there’s no salt added to the recipe and my fudge has never turned out gritty, so I’m just trying to figure out what we did differently. how can I make this recipe with less fat, can I replace the coconut butter with something else? would a scoop of whey mess the recipe? The fudge won’t solidify if you reduce the coconut butter. Whey doesn’t thicken much, so if you try adding a protein powder I’d try casein protein.